Having been aware of this so-called "debate" on the Internet (please note: it is entirely an "online debate" not one advanced by serious NT or historical Jesus scholars) since the mid 1990s, I am glad that J.P. Holding has finally transcribed and edited some of his impressive "Tektonics" online articles for an entire book on "Shattering the Christ Myth." He and his amateur scholar contributors have pulled together an excellent set of articles and chapters debunking both the "myth" hypothesis and the "copycat" or "pagan parallel" thesis presented by many an anti-Christian conspiracy buff and uninformed skeptic of historical Christianity. Chapters include an introduction on the history and origin of the "Christ myth" claims dating from the early 1800s; detailed defenses of the standard non-biblical references to Jesus from the Jewish historian Josephus (his two passages), the Roman historian Tacitus, Lucian, Pliny the Younger, and Papias; responses to the various "silences" argued by "mythicists" from Remsburg to G.A. Wells to Earl Doherty; analysis of the supposed "pagan Christs" from Mithra to Krishna to Horus to Dionysos; reviews and refutations exposing the abysmal scholarship and poor arguments of recent "Christ myth" movies "The God Who Wasn't There" and "Zeitgeist"; and additional material on the city of Nazareth, the academic and Internet mythicists, and more. This book shows there is really nothing at all to the "mythicist" claims: they are groundless historically, poorly argued based on "silence" and refuted by numerous reliable witnesses to Jesus, and that includes the canonical Gospels and the earliest writings of St. Paul. The real debate among scholars is not whether there was a historical Jesus who was crucified under Pontius Pilate around 30 AD, but on Christ's claims to divinity and being the unique Son of God, the miracles of the Gospels as signs of that divinity, and especially the bodily resurrection of Jesus Christ -- i.e. the whole "Jesus of history" vs. "Christ of faith" debate among conservative evangelical and more "liberal" scholarship. 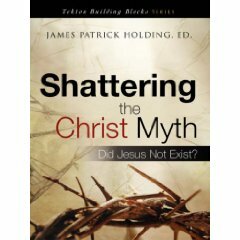 Shattering the Christ Myth is a welcome addition to the many evangelical defenses of Jesus Christ by well-known scholars such as R.T. France (The Evidence for Jesus), Moreland/Wilkins (Jesus Under Fire), and recently Boyd/Eddy (The Jesus Legend: A Case for the Historical Reliability of the Synoptic Jesus Tradition). As a Catholic apologist, I also appreciated the brief chapter on "Leo's Line" explaining the "fable quote" sometimes attributed to Pope Leo X by mythicist skeptics. My only complaint is the book is slightly "oversized" so it is not the size of your normal paperback and may not fit easily on your bookshelf. Nevertheless a definite 5-star effort from apologist J.P. Holding and company. OK, I'll try to explain, but I'm no expert on this topic. You should go ahead and get the J.P. Holding book, and write your own fair and detailed review. In the mid-1990s I became aware of this whole "Jesus myth" thing from some radical skeptic forums I was involved with on Usenet and FidoNet (particularly the old obnoxious "HolySmoke" forum). At the time I was a beginning Internet "Catholic lay apologist" (mainly inspired by Karl Keating and Catholic Answers) trying to sort out the whole Catholic-Protestant "fundamentalist" debate thing (along with a few Greek/Eastern Orthodox Christians too), and occasionally ventured into the skeptic-Christian debate. At that time the 80-year-old essay by M. M. Mangasarian "The Truth about Jesus : Is He a Myth?" (orig 1909) I remember was regularly posted at HolySmoke and elsewhere. That was my introduction to the "Jesus myth" claims, and I found this very strange that someone would actually deny Jesus even existed. Sure atheists believed God didn't exist, I knew that already. But that there was no historical Jesus? I never heard that before. Wells is now saying he never really believed the "mythicist" claim. In the 1970s however, Wells had at least two books that many atheists and skeptics interpreted as arguing for the "Jesus myth" position, and these are probably the books that Michael Grant is referring to above in his 1977 book on Jesus, along with the earlier "Jesus myth" scholars (very few of them) dating back to the late 19th, early 20th century. By the 1920s the earliest "mythicist" claims were answered, annihilated, shattered, and obliterated, and then later in the 1970s when they re-surfaced with G.A. Wells, his bogus claims were again answered, annihilated, shattered and obliterated by such historians as Michael Grant, once again in the 1980s (since Wells was still publishing his books) by the evangelical scholar R.T. France (The Evidence for Jesus), and then in the 1990s when Doherty replaced Wells as the primary "Jesus myth" scholar/historian for the skeptic/atheist community, the J.P. Holding online articles (and now his oversized book) answers, annihilates, shatters, and obliterates their claims all over again in excruciating detailed fashion (in my opinion, read the book for yourself). It is also true (just as I said) that this whole "debate" is limited to mainly online discussion forums (such as the Infidels.org) and web sites (and a couple of self-published books) and isn't addressed by professionals anymore, and is simply ignored by mainstream biblical scholarship and modern historical Jesus studies. E.G. see the Crossans vs. the Craigs, the Borgs vs. the Wrights, the Jesus Seminar or more "liberal" types vs. the evangelicals, or traditional or moderate Catholic scholars like Raymond Brown or John P. Meier, etc. None of these guys are "mythicists" and they do not even address them or their "arguments." Why? Because there is no real "debate" on the subject, never has been. That is my understanding after carefully studying this subject as an amateur the past 10+ years. I have Michael Grant's 1977 edition of his book, I might be able to type in some of his criteria. Also you are correct that R.T. France conceded the point to Wells on Tacitus, France says: "I find Wells' argument entirely convincing. Tacitus' reference to 'Christus' is evidence only for what was believed about Christian origins at the time he wrote, and there is plenty of other evidence for that." (France, Evidence for Jesus, page 23 [1986 edition]). France concedes that Tacitus is not necessarily independent testimony. But on all other evidence, France argues against Wells. J.P. Holding's book argues differently on Tacitus, citing various scholars. BTW, Yes I am sure. Tacitus takes up 3 or 4 pages in France's book, Suetonius a page, Pliny the Younger a page, Josephus 8 pages. The R.T. France book The Evidence for Jesus is 190+ pages so obviously there is more to the book than the non-biblical references to Jesus. He doesn't concede everything to Wells, he simply agrees that Tacitus does not provide "independent testimony" and that Suetonius and Pliny the Younger give us no additional information about Jesus. The chapters in the France book are "Non-Christian Evidence" (40 pages), "Christian Evidence Outside the NT" (about 30 pages), "Evidence of the NT" (55 pages), "Evidence of Archaeology" (18 pages), and "Jesus in History" (10 pages). The main G.A. Wells arguments to fall is the supposed "silence of Paul" about Jesus and the unreliability of the NT. Not only France The Evidence for Jesus (1986) demolishes Wells, but also Habermas The Historical Jesus: Ancient Evidence for the Life of Christ (1996) demolishes Wells, and Boyd/Eddy The Jesus Legend (2007) demolishes both Wells and Doherty, and now J.P. Holding Shattering the Christ Myth also demolishes both Wells and Doherty (in my opinion). Remember G.A. Wells says he never held to the "mythicist position" in the first place! Although many scholars certainly have interpreted his first 2 or 3 books to teach just that. As for Michael Grant's historical criterion, although he does not directly address Wells or his arguments, I find him more believable than Wells. Grant is certainly more credentialed to write as a historian on the topic: Michael Grant has been a Fellow of Trinity College, Cambridge, Professor of Humanity at Edinburgh Univ, and President and Vice-Chan of the Queen's Univ, Belfast. He holds Doctorates of Cambridge, Dublin, and Belfast. His books include The Twelve Caesars, The Army of the Caesars, The Annals of Imperial Rome, and Saint Paul. He is not a believer, but a skeptic. Here is a summary from Grant's Jesus: An Historian's Review of the Gospels (1977 edition is what I have, it is also available used in the 1995 edition). there are three possible approaches: one can write as a believer, or as an unbeliever, or as Grant has attempted "as a student of history seeking...to employ methods that make belief or unbelief irrelevant." Read Grant's book or the Boyd/Eddy book. The Gospels are the evidence you are looking for. Josephus also stands (both passages, one partially authentic), see the long detailed chapter on Josephus in J.P. Holding's book. Did you forget that even G.A. Wells says he never fully believed the "Christ-myth" claim (see his 2004 book which I quoted) ? BTW, Judas is mentioned in all four Gospels (e.g. Matt 10:2ff) and Acts. So is Jesus of Nazareth, and in the Acts, and the NT letters. That's enough for most historians (like Michael Grant). Who are the first-rank scholars from 1920 to 1970 who even postulated the non-historicity of Jesus (that Jesus did not exist) ? "While the claim that aspects of the Christian view of Jesus parallel, even are indebted to, ancient pagan legends and myths has a long history, it gained prominence with the birth of the history of religions school (Religionsgeschichtliche Schule) in the late nineteenth and early twentieth centuries....The history of religions school was extremely popular in academic circles for several decades, but owing to trenchant critiques by such scholars as Samuel Cheetham , H.A.A. Kennedy , J. Gresham Machen , A.D. Nock , Bruce Metzger , and Gunter Wagner , it eventually fell out of fashion." (The Jesus Legend: A Case for the Historical Reliability of the Synoptic Jesus Tradition [Baker Academic, 2007], pages 134,136). They also mention a book by W.D. Davies and D. Daube  with a chapter on the demise of the "history of religions" school. Besides the first "Jesus mythers" from the early 20th century (e.g. Arthur Drews, who claimed all of Paul's letters were forgeries), Hannam names P.L. Couchoud The Enigma of Jesus (1924) who was a medical doctor, not a biblical scholar, and a French book La Fable de Jesus Christ (1967) by G. Fan. Then there's Archibald Robertson Jesus: Myth or History (1949) and Herbert Cutner Jesus: God, Man or Myth? (1950). In the 1960s there was John Allegro and his "sacred mushroom" hypothesis. Among the thousands upon thousands of books and journal articles published on the historical Jesus and Jesus-like topics by thousands of various biblical or classical scholars and historians, can you name any others from 1920 to 1970 (a period of 50 years), that accepted these "great arguments" of the "Jesus myth" types that supposedly weren't rebutted (or annihilated) properly 100 years ago? Why did these "great arguments" for "Jesus mythicism" die out in mainstream scholarship in the 1920s? Why were these "great arguments" ignored for 50 years? I now own all of these books but it's gonna take some time to read them all a couple times so I understand the arguments. Hope to finish Part 2 of my little "historical Jesus" project by Christmas 2008. Part 2 will summarize what I consider the best evidence for Jesus (arguments and data culled from the above books), a brief refutation of "The God Who Wasn't There" DVD, and the best responses to Doherty's book. Part 1 on "pagan parallels" is finished. I am an amateur, like most of us, and like Peter Kirby (thanks for his review of Habermas), but I do enjoy this "online debate" we have (even if it's ignored by mainstream scholarship). Yep, me and a billion other Catholics (according to World Christian Encyclopedia raw stats). Not sure about the floating part, but the ascension does require at least a "going up" and disappearing into the "dimension" of heaven. And yes Christ's return is part of the classic Christian creeds. "He will return to judge the living and the dead." And I actively go out of my way to read the best stuff against my beliefs as well. I am unique like that. I have one Robert Price book, one G.A. Wells book, the Doherty book, several atheist books (Dan Barker, Vic Stenger, Richard Dawkins, David Mills, George Smith, etc), and I defend evolution often at the Catholic Answers boards. Hooray! That's the "real" scholarly debate. The "historical Jesus didn't exist" isn't a valid debate in today's NT or Jesus scholarship. The "Jesus of history" vs. the "Christ of faith" is what divides traditional Catholics and conservative evangelicals on the one side, from "Jesus Seminar" or more "liberal" branches of Christian scholars on the other. The Wrights vs. the Borgs (The Meaning of Jesus: Two Visions), the Craigs vs. the Crossans (Will the Real Jesus Please Stand Up? ), and that is a more "respectable" debate in my opinion since at least it represents a sizeable number of people on each side. This "historical Jesus didn't exist" business is only found here on this site, other spin-off atheist or "freethought" sites, other eccentrics and cranks (Acharya S, Freke/Gandy), and one semi-scholarly book today: Earl Doherty's. And J.P. Holding's book does a number on all of these. The real debate is between more conservative or "traditional" biblical scholars (Catholic, or evangelical, or Orthodox) who affirm Jesus Christ is the Son of God, and those liberals or modernist scholars (Catholic, or Protestant, or Orthodox or skeptics) and others who reject that.